We are a leading Exporter of custom printed scroll invitation for weddings, handmade paper scroll invitations, handmade paper mini scroll invitations, handmade paper wedding scroll roll, scroll invitations and scroll invitations with embroidered boxes from Mumbai, India. 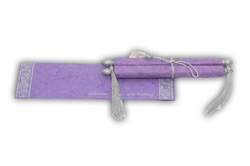 High quality Scroll Invites, made using good quality Wooden Scroll Rods,.Using Good Quality Cotton Rag Textured Handmade Paper, we manufacture a fantastic range Of Scroll invites available with Matching Boxes. We manufacture a large range of scroll invitations from our extensively large range of Handmade Papers, We can print your content on the scrolls as per your specifications, the invitations can be customized to your requirements of color, size etc. Scroll invites are available in Handmade Paper and Non Woven Paper Options. 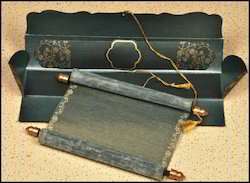 We also use Silk Handmade Paper for making our Scroll Invitations. 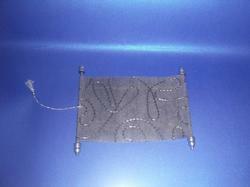 This particular Scroll Invitation is Mini Baby sized 3*2 Inches with a Gold Thread for Hanging . High quality Scroll Invites, made using Embroidered Handmade Paper Box Scroll Invite with a Beautifully Printed Invite ,.Using Good Quality Cotton Rag or Silk Textured Handmade Paper, we manufacture a fantastic range Of Scroll Invitations . 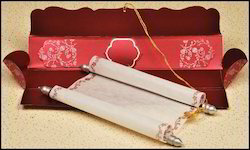 These Scroll Invites are available in assorted Colors. The Scroll Invitations are available in Matching Boxes.. Our scrolls are easily printable.. We manufacture a large range of scroll invitations from our extensively large range of Handmade Papers, We can print your content on the scrolls as per your specifications, the invitations can be customized to your requirements of color, size etc. Scroll invites are available in Handmade Paper and Non Woven Paper Options. 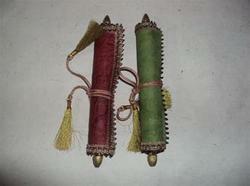 We also use Silk Handmade Paper for making our Scroll Invitations We can also provide tassel edges on all invitations. Scroll Invitations are available with Embossing, Foil Stamping and Silk Screened Options We also try and understand your requirement, our client service team helps you get packaging that actually meets your needs, we just do not make Scroll Invitations , we try and understand what exactly you need. 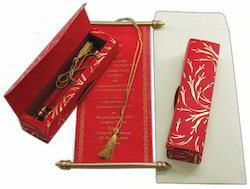 We are also making a large range of Scroll Invitations with Embroidered Boxes. We are supplying these boxes to Wedding Card Designers, Wedding Stores, Wedding Supplies Wholesalers Worldwide. High quality Scroll Invites, made using Non Woven Papers and Custom Printed as per your specifications. Using Good Quality Cotton Rag or Silk Textured Handmade Paper, we manufacture a fantastic range Of Scroll Invitations . 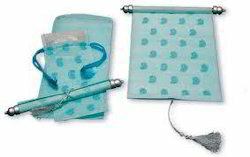 These Scroll Invites are available in assorted Colors. The Scroll Invitations are available in Matching Boxes.. Our scrolls are easily printable.. We manufacture a large range of scroll invitations from our extensively large range of Handmade Papers, We can print your content on the scrolls as per your specifications, the invitations can be customized to your requirements of color, size etc. Scroll invites are available in Handmade Paper and Non Woven Paper Options. We also use Silk Handmade Paper for making our Scroll Invitations We can also provide tassel edges on all invitations. Scroll Invitations are available with Embossing, Foil Stamping and Silk Screened Options We also try and understand your requirement, our client service team helps you get packaging that actually meets your needs, we just do not make Scroll Invitations , we try and understand what exactly you need. 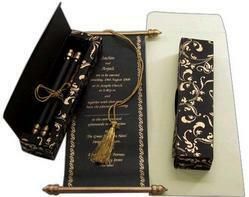 We are also making a large range of Scroll Invitations with Embroidered Boxes. We are supplying these boxes to Wedding Card Designers, Wedding Stores, Wedding Supplies Wholesalers Worldwide, Restaurants, etc. We also customize our scrolls to be printed in your native language.. We are also making Scrolls for Baby Showers and Related Events. 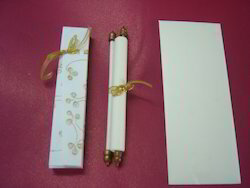 We manufacture Scroll Invites with Wood or Plastic Scroll Rods. 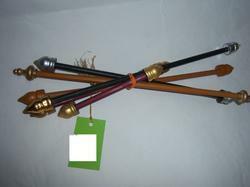 We have recently started making a range of Brass Scroll Rods for our invitations. Rush Orders Accepted. We manufacture a large range of Scroll Invites made on Indian Theme Handmade Papers, We can also customize the scroll colors and themes as per your directions..High quality Scroll Invites, made using Non Woven Papers and Custom Printed as per your specifications. Using Good Quality Cotton Rag or Silk Textured Handmade Paper, we manufacture a fantastic range Of Scroll Invitations . These Scroll Invites are available in assorted Colors. The Scroll Invitations are available in Matching Boxes.. Our scrolls are easily printable.. We manufacture a large range of scroll invitations from our extensively large range of Handmade Papers, We can print your content on the scrolls as per your specifications, the invitations can be customized to your requirements of color, size etc. Scroll invites are available in Handmade Paper and Non Woven Paper Options. 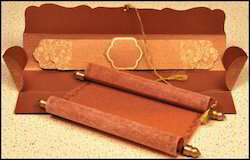 We also use Silk Handmade Paper for making our Scroll Invitations We can also provide tassel edges on all invitations. Scroll Invitations are available with Embossing, Foil Stamping and Silk Screened Options We also try and understand your requirement, our client service team helps you get invitations that actually meets your needs, we just do not make Scroll Invitations , we try and understand what exactly you need. 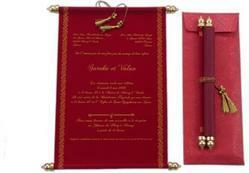 We are also making a large range of Scroll Invitations with Embroidered Boxes. We are supplying these boxes to Wedding Card Designers, Wedding Stores, Wedding Supplies Wholesalers Worldwide, Restaurants, etc. We also customize our scrolls to be printed in your native language.. We are also making Scrolls for Baby Showers, Birthday Parties and Related Events. 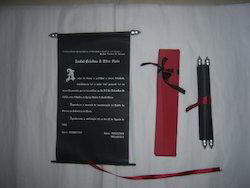 We manufacture Scroll Invites with Wood or Plastic Scroll Rods. We have recently started making a range of Brass Scroll Rods for our invitations. Rush Orders Accepted.. 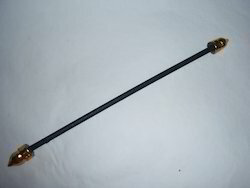 The Minimum Order that we usually accept is 100 Pcs. We print our Scroll Invites in any language as per clients requirements, we have printed scroll invites in Hebrew, Portuguese, German, Italian, French, Spanish, etc.Customized Handmade Paper Scroll Invitations all made as per client specifications and also available Un printed for Whole Sale Users.We carry a large range of Scroll Invitations made as per client requirements in client specified colors and with client specified themes and prints. Custom Made, Custom Printed available in a wide variety of Colors, Designs and Textures, We carry a huge range of Scroll Invites that are suitable for use in Weddings, Baby Showers or any other announcements. We manufacture a large range of Boxed Scroll Invites wit printing made as per client specifications of sizes and colors, our invite are available in a wide variety of colors, finishes and patternsOur Handmade/ Non Woven Paper Scroll Invites are also available with Matching Printed Envelopes, We can manufacture these scroll invitations as per your range of Colors and Print Patterns, we also print inside the invites as per your specifications. Burgundy Colored Handmade Paper Boxed Scroll Invitations, suitable for Wedding Scroll Invites, we can custom print on these invitations as per your requirement. Scroll Invites are also available in Non Woven Papers also. Beautiful Contrast colored Scroll Invitations with Indian ethnic design prints, available with Box, Hard Box or Flat Box ,and all custom printed as per your requirements. We can also customize the scroll colors and themes as per your directions..High quality Scroll Invites, made using Non Woven Papers and Custom Printed as per your specifications. Using Good Quality Cotton Rag or Silk Textured Handmade Paper, we manufacture a fantastic range Of Scroll Invitations . These Scroll Invites are available in assorted Colors. 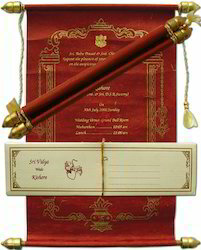 The Scroll Invitations are available in Matching Boxes.. Our scrolls are easily printable.. We manufacture a large range of scroll invitations from our extensively large range of Handmade Papers, We can print your content on the scrolls as per your specifications, the invitations can be customized to your requirements of color, size etc. Scroll invites are available in Handmade Paper and Non Woven Paper Options. 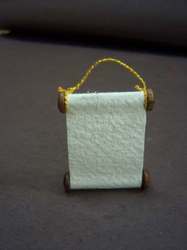 We also use Silk Handmade Paper for making our Scroll Invitations We can also provide tassel edges on all invitations. Scroll Invitations are available with Embossing, Foil Stamping and Silk Screened Options We also try and understand your requirement, our client service team helps you get invitations that actually meets your needs, we just do not make Scroll Invitations , we try and understand what exactly you need. 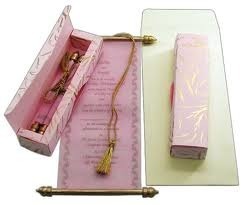 We are also making a large range of Scroll Invitations with Embroidered Boxes. We are supplying these boxes to Wedding Card Designers, Wedding Stores, Wedding Supplies Wholesalers Worldwide, Restaurants, etc. We also customize our scrolls to be printed in your native language.. We are also making Scrolls for Baby Showers, Birthday Parties and Related Events. 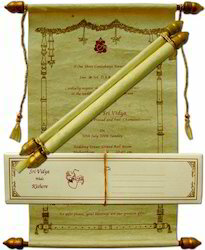 We manufacture Scroll Invites with Wood or Plastic Scroll Rods. 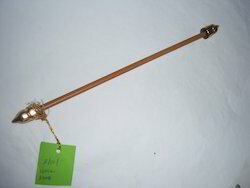 We have recently started making a range of Brass Scroll Rods for our invitations. Rush Orders Accepted.. The Minimum Order that we usually accept is 100 Pcs. 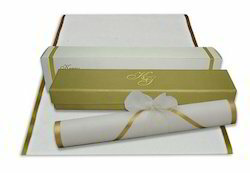 Custom Made Boxed Scroll Invitations available in a large assortment of Patterns, Colors and Themes. Blue Scroll Invitations with Screen Printed Pattern Design and Matching Envelopes available with Tassel. Simple and Elegant Pink Scroll Invitations with Ribbon Tie Boxes, available with Custom Prints as per clients specifications. We manufacture a large range of Scroll Invites in Various Colors, Prints and Themes. Wedding Scroll Invitations available in a wide variety of colors, patterns etc. Antique Look Scroll Invitations with Custom Prints as per clients requirements.We also manufacture Non woven Embroidered Scroll Invitations, which have the Back side with Embroidery and the front side plain to print the message.Black Elegant Scroll Invitations with A Good Quality Gold Screen Print. Boxed Scroll Invites can be custom made in any color combination as per clients requirements and can also be custom printed. We print our Scroll Invites in any language as per clients requirements, we have printed scroll invites in Hebrew, Portuguese, German, Italian, French, Spanish, etc.Customized Handmade Paper Scroll Invitations all made as per client specifications and also available Un printed for Whole Sale Users.We carry a large range of Scroll Invitations made as per client requirements in client specified colors and with client specified themes and prints. Custom Made, Custom Printed available in a wide variety of Colors, Designs and Textures, We carry a huge range of Scroll Invites that are suitable for use in Weddings, Baby Showers or any other announcements. We manufacture a large range of Boxed Scroll Invites wit printing made as per client specifications of sizes and colors, our invite are available in a wide variety of colors, finishes and patternsOur Handmade/ Non Woven Paper Scroll Invites are also available with Matching Printed Envelopes, We can manufacture these scroll invitations as per your range of Colors and Print Patterns, we also print inside the invites as per your specifications. Burgundy Colored Handmade Paper Boxed Scroll Invitations, suitable for Wedding Scroll Invites, we can custom print on these invitations as per your requirement. Scroll Invites are also available in Non Woven Papers also. Beautiful Contrast colored Scroll Invitations with Indian ethnic design prints, available with Box, Hard Box or Flat Box ,and all custom printed as per your requirements. We can also customize the scroll colors and themes as per your directions..High quality Scroll Invites, made using Non Woven Papers and Custom Printed as per your specifications. Using Good Quality Cotton Rag or Silk Textured Handmade Paper, we manufacture a fantastic range Of Scroll Invitations . Boxed scroll invitations are also available with matching rsvp cards. Antique look scroll invitations, printed on our antique look papers with a gold border. Custom printed scroll invitations available in a wide variety of prints, patterns and textures. Custom made scroll invitations , printed as per clients requirements. Blank scroll invitations which can be printed as per customer specifications and these are available in a variety of colors and options. Custom made boxed scroll invitations available in a large assortment of patterns, colors and themes. Blue scroll invitations with screen printed pattern design and matching envelopes available with tassel. Simple and elegant pink scroll invitations with ribbon tie boxes, available with custom prints as per clients specifications. we manufacture a large range of scroll invites in various colors, prints and themes. 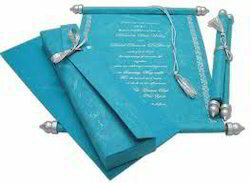 Wedding scroll invitations available in a wide variety of colors, patterns etc. Antique look scroll invitations with custom prints as per clients requirements. We also manufacture non woven embroidered scroll invitations, which have the back side with embroidery and the front side plain to print the message. Black elegant scroll invitations with a good quality gold screen print. Boxed scroll invites can be custom made in any color combination as per clients requirements and can also be custom printed. 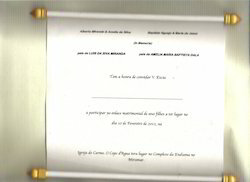 We print our scroll invites in any language as per clients requirements, we have printed scroll invites in hebrew, portuguese, german, italian, french, spanish, etc. Customized handmade paper scroll invitations all made as per client specifications and also available un printed for whole sale users. We carry a large range of scroll invitations made as per client requirements in client specified colors and with client specified themes and prints. Custom made, custom printed available in a wide variety of colors, designs and textures, we carry a huge range of scroll invites that are suitable for use in weddings, baby showers or any other announcements. We manufacture a large range of boxed scroll invites wit printing made as per client specifications of sizes and colors, our invite are available in a wide variety of colors, finishes and patternsour handmade/ non woven paper scroll invites are also available with matching printed envelopes, we can manufacture these scroll invitations as per your range of colors and print patterns, we also print inside the invites as per your specifications. Burgundy colored handmade paper boxed scroll invitations, suitable for wedding scroll invites, we can custom print on these invitations as per your requirement. Scroll invites are also available in non woven papers also. Beautiful contrast colored scroll invitations with indian ethnic design prints, available with box, hard box or flat box ,and all custom printed as per your requirements. We can also customize the scroll colors and themes as per your directions. . High quality scroll invites, made using non woven papers and custom printed as per your specifications. Using good quality cotton rag or silk textured handmade paper, we manufacture a fantastic range of scroll invitations . 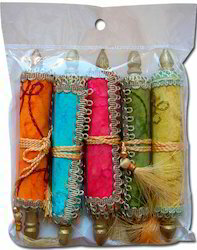 These scroll invites are available in assorted colors. The scroll invitations are available in matching boxes. . Our scrolls are easily printable. . We manufacture a large range of scroll invitations from our extensively large range of handmade papers, we can print your content on the scrolls as per your specifications, the invitations can be customized to your requirements of color, size etc. Scroll invites are available in handmade paper and non woven paper options. 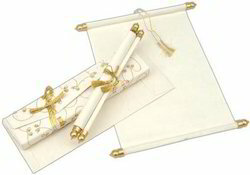 We also use silk handmade paper for making our scroll invitations we can also provide tassel edges on all invitations. Scroll invitations are available with embossing, foil stamping and silk screened options we also try. Embroidered scroll invites in white, ivory colours. Boxed scroll invitations are also available with matching RSVP cards. Antique look scroll invitations, printed on our antique look papers with a gold border. Custom printed scroll invitations available in a wide variety of prints, patterns and textures. Custom made scroll invitations, printed as per clients requirements. Blank scroll invitations which can be printed as per customer specifications and these are available in a variety of colors and options. Custom made boxed scroll invitations available in a large assortment of patterns, colors and themes. Blue scroll invitations with screen printed pattern design and matching envelopes available with tassel. Simple and elegant pink scroll invitations with ribbon tie boxes, available with custom prints as per clients specifications. we manufacture a large range of scroll invites in various colors, prints and themes. Wedding scroll invitations available in a wide variety of colors, patterns etc. Antique look scroll invitations with custom prints as per clients requirements. We also manufacture non woven embroidered scroll invitations, which have the back side with embroidery and the front side plain to print the message. Black elegant scroll invitations with a good quality gold screen print. Boxed scroll invites can be custom made in any color combination as per clients requirements and can also be custom printed. We print our scroll invites in any language as per clients requirements, we have printed scroll invites in hebrew, portuguese, german, italian, french, spanish, etc. Customized handmade paper scroll invitations all made as per client specifications and also available un printed for whole sale users. We carry a large range of scroll invitations made as per client requirements in client specified colors and with client specified themes and prints. Custom made, custom printed available in a wide variety of colors, designs and textures, we carry a huge range of scroll invites that are suitable for use in weddings, baby showers or any other announcements. We manufacture a large range of boxed scroll invites wit printing made as per client specifications of sizes and colors, our invite are available in a wide variety of colors, finishes and patternsour handmade/ non woven paper scroll invites are also available with matching printed envelopes, we can manufacture these scroll invitations as per your range of colors and print patterns, we also print inside the invites as per your specifications. Burgundy colored handmade paper boxed scroll invitations, suitable for wedding scroll invites, we can custom print on these invitations as per your requirement. Scroll invites are also available in non woven papers also. Beautiful contrast colored scroll invitations with indian ethnic design prints, available with box, hard box or flat box ,and all custom printed as per your requirements. We can also customize the scroll colors and themes as per your directions. . High quality scroll invites, made using non woven papers and custom printed as per your specifications. Using good quality cotton rag or silk textured handmade paper, we manufacture a fantastic range of scroll invitations. These scroll invites are available in assorted colors. 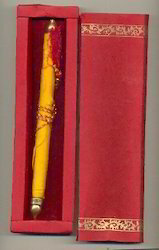 The scroll invitations are available in matching boxes. Our scrolls are easily printable. We manufacture a large range of scroll invitations from our extensively large range of handmade papers, we can print your content on the scrolls as per your specifications, the invitations can be customized to your requirements of color, size etc. Scroll invites are available in handmade paper and non woven paper options. 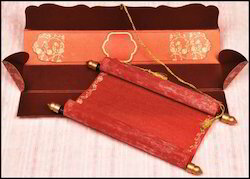 We also use silk handmade paper for making our scroll invitations we can also provide tassel edges on all invitations. Boxed designer scroll invites which can be shipped blank on printer compatible papers. Scroll invitations available in a large assortment of styles. Boxed scroll invitations in a wide variety of box styles. Scroll invitations for baby girl shower, made exclusively in pink colors. Embroidered scroll invites in white, ivory colors. Boxed scroll invitations are also available with matching rsvp cards. Antique look scroll invitations, printed on our antique look papers with a gold border. Custom printed scroll invitations available in a wide variety of prints, patterns and textures. Custom made scroll invitations, printed as per clients requirements. Blank scroll invitations which can be printed as per customer specifications and these are available in a variety of colors and options. 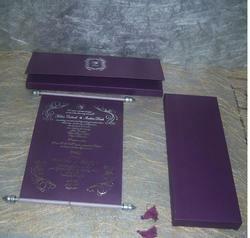 Custom made boxed scroll invitations available in a large assortment of patterns, colors and themes. Blue scroll invitations with screen printed pattern design and matching envelopes available with tassel. Simple and elegant pink scroll invitations with ribbon tie boxes, available with custom prints as per clients specifications. we manufacture a large range of scroll invites in various colors, prints and themes. Wedding scroll invitations available in a wide variety of colors, patterns etc. Antique look scroll invitations with custom prints as per clients requirements. We also manufacture non woven embroidered scroll invitations, which have the back side with embroidery and the front side plain to print the message. Black elegant scroll invitations with a good quality gold screen print. Boxed scroll invites can be custom made in any color combination as per clients requirements and can also be custom printed. We print our scroll invites in any language as per clients requirements, we have printed scroll invites in hebrew, portuguese, german, italian, french, spanish, etc. Customized handmade paper scroll invitations all made as per client specifications and also available un printed for whole sale users. We carry a large range of scroll invitations made as per client requirements in client specified colors and with client specified themes and prints. Custom made, custom printed available in a wide variety of colors, designs and textures, we carry a huge range of scroll invites that are suitable for use in weddings, baby showers or any other announcements. We manufacture a large range of boxed scroll invites wit printing made as per client specifications of sizes and colors, our invite are available in a wide variety of colors, finishes and patternsour handmade/ non woven paper scroll invites are also available with matching printed envelopes, we can manufacture these scroll invitations as per your range of colors and print patterns, we also print inside the invites as per your specifications. Burgundy colored handmade paper boxed scroll invitations, suitable for wedding scroll invites, we can custom print on these invitations as per your requirement. Scroll invites are also available in non woven papers also. Beautiful contrast colored scroll invitations with indian ethnic design prints, available with box, hard box or flat box, and all custom printed as per your requirements. We can also customize the scroll colors and themes as per your directions. . High quality scroll invites, made using non woven papers and custom printed as per your specifications. Using good quality cotton rag or silk textured handmade paper, we manufacture a fantastic range of scroll invitations . These scroll invites are available in assorted colors. The scroll invitations are available in matching boxes. . Our scrolls are easily printable. . We manufacture a large range of scroll invitations from our extensively large range of handmade papers, we can print your content on the scrolls as per your specifications, the invitations can be customized to your requirements of color, size etc. Boxed Designer Scroll Invites which can be shipped blank on Printer Compatible Papers. Scroll Invitations available in a large assortment of styles. Boxed Scroll Invitations in a wide variety of Box Styles. Scroll Invitations for Baby Girl Shower, made exclusively in Pink Colors. Embroidered Scroll Invites in White , Ivory Colors. Boxed Scroll Invitations are also available with Matching RSVP Cards. Antique Look Scroll Invitations, Printed on our Antique Look Papers with A Gold Border. Custom Printed Scroll Invitations available in a wide variety of prints, patterns and textures. Custom Made Scroll Invitations , Printed as per clients requirements. Blank Scroll Invitations which can be printed as per customer specifications and these are available in a variety of colors and options. Custom Made Boxed Scroll Invitations available in a large assortment of Patterns, Colors and Themes. Blue Scroll Invitations with Screen Printed Pattern Design and Matching Envelopes available with Tassel. Simple and Elegant Pink Scroll Invitations with Ribbon Tie Boxes, available with Custom Prints as per clients specifications. We manufacture a large range of Scroll Invites in Various Colors, Prints and Themes. Wedding Scroll Invitations available in a wide variety of colors, patterns etc. Antique Look Scroll Invitations with Custom Prints as per clients requirements.We also manufacture Non woven Embroidered Scroll Invitations, which have the Back side with Embroidery and the front side plain to print the message.Black Elegant Scroll Invitations with A Good Quality Gold Screen Print. Boxed Scroll Invites can be custom made in any color combination as per clients requirements and can also be custom printed. We print our Scroll Invites in any language as per clients requirements, we have printed scroll invites in Hebrew, Portuguese, German, Italian, French, Spanish, etc.Customized Handmade Paper Scroll Invitations all made as per client specifications and also available Un printed for Whole Sale Users.We carry a large range of Scroll Invitations made as per client requirements in client specified colors and with client specified themes and prints. Custom Made, Custom Printed available in a wide variety of Colors, Designs and Textures, We carry a huge range of Scroll Invites that are suitable for use in Weddings, Baby Showers or any other announcements. We manufacture a large range of Boxed Scroll Invites wit printing made as per client specifications of sizes and colors, our invite are available in a wide variety of colors, finishes and patternsOur Handmade/ Non Woven Paper Scroll Invites are also available with Matching Printed Envelopes, We can manufacture these scroll invitations as per your range of Colors and Print Patterns, we also print inside the invites as per your specifications. Burgundy Colored Handmade Paper Boxed Scroll Invitations, suitable for Wedding Scroll Invites, we can custom print on these invitations as per your requirement. Scroll Invites are also available in Non Woven Papers also. Beautiful Contrast colored Scroll Invitations with Indian ethnic design prints, available with Box, Hard Box or Flat Box ,and all custom printed as per your requirements. We can also customize the scroll colors and themes as per your directions..High quality Scroll Invites, made using Non Woven Papers and Custom Printed as per your specifications. Using Good Quality Cotton Rag or Silk Textured Handmade Paper, we manufacture a fantastic range Of Scroll Invitations . These Scroll Invites are available in assorted Colors. The Scroll Invitations are available in Matching Boxes.. Our scrolls are easily printable.. We manufacture a large range of scroll invitations from our extensively large range of Handmade Papers, We can print your content on the scrolls as per your specifications, the invitations can be. 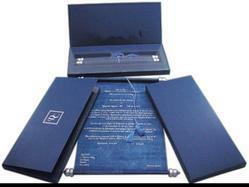 Boxed Designer Scroll Invites which can be shipped blank on Printer Compatible Papers. Scroll Invitations available in a large assortment of styles. Boxed Scroll Invitations in a wide variety of Box Styles. Scroll Invitations for Baby Girl Shower, made exclusively in Pink Colors. Embroidered Scroll Invites in White , Ivory Colors. Boxed Scroll Invitations are also available with Matching RSVP Cards. Antique Look Scroll Invitations, Printed on our Antique Look Papers with A Gold Border. Custom Printed Scroll Invitations available in a wide variety of prints, patterns and textures. Custom Made Scroll Invitations , Printed as per clients requirements. Blank Scroll Invitations which can be printed as per customer specifications and these are available in a variety of colors and options. Custom Made Boxed Scroll Invitations available in a large assortment of Patterns, Colors and Themes. Blue Scroll Invitations with Screen Printed Pattern Design and Matching Envelopes available with Tassel. Simple and Elegant Pink Scroll Invitations with Ribbon Tie Boxes, available with Custom Prints as per clients specifications. We manufacture a large range of Scroll Invites in Various Colors, Prints and Themes. Wedding Scroll Invitations available in a wide variety of colors, patterns etc. Antique Look Scroll Invitations with Custom Prints as per clients requirements.We also manufacture Non woven Embroidered Scroll Invitations, which have the Back side with Embroidery and the front side plain to print the message.Black Elegant Scroll Invitations with A Good Quality Gold Screen Print. Boxed Scroll Invites can be custom made in any color combination as per clients requirements and can also be custom printed. We print our Scroll Invites in any language as per clients requirements, we have printed scroll invites in Hebrew, Portuguese, German, Italian, French, Spanish, etc.Customized Handmade Paper Scroll Invitations all made as per client specifications and also available Un printed for Whole Sale Users.We carry a large range of Scroll Invitations made as per client requirements in client specified colors and with client specified themes and prints. Custom Made, Custom Printed available in a wide variety of Colors, Designs and Textures, We carry a huge range of Scroll Invites that are suitable for use in Weddings, Baby Showers or any other announcements. We manufacture a large range of Boxed Scroll Invites wit printing made as per client specifications of sizes and colors, our invite are available in a wide variety of colors, finishes and patternsOur Handmade/ Non Woven Paper Scroll Invites are also available with Matching Printed Envelopes, We can manufacture these scroll invitations as per your range of Colors and Print Patterns, we also print inside the invites as per your specifications. Burgundy Colored Handmade Paper Boxed Scroll Invitations, suitable for Wedding Scroll Invites, we can custom print on these invitations as per your requirement. Scroll Invites are also available in Non Woven Papers also. Beautiful Contrast colored Scroll Invitations with Indian ethnic design prints, available with Box, Hard Box or Flat Box ,and all custom printed as per your requirements. We can also customize the scroll colors and themes as per your directions..High quality Scroll Invites, made using Non Woven Papers and Custom Printed as per your specifications. Using Good Quality Cotton Rag or Silk Textured Handmade Paper, we manufacture a fantastic range Of Scroll Invitations . These Scroll Invites are available in assorted Colors. The Scroll Invitations are available in Matching Boxes.. Our scrolls are easily printable.. We manufacture a large range of scroll invitations from our extensively large range of Handmade Papers, We can print your content on the scrolls as per your specifications, the invitations can be customized to your requirements of color, size etc. 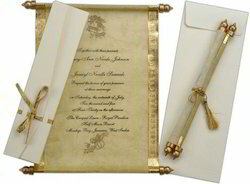 Custom Printed Scroll Invitation with Matching Envelope made in silk Paper. 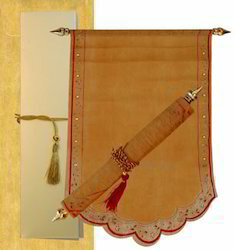 Silk Handmade Paper Scroll Invitations with Customized Prints for any occasions. Boxed Scroll Invitations Shipped in Flat Boxes with Custom Logo Embossing, Available in a wide variety of Colors. Boxed Designer Scroll Invites which can be shipped blank on Printer Compatible Papers. Scroll Invitations available in a large assortment of styles. Boxed Scroll Invitations in a wide variety of Box Styles. Scroll Invitations for Baby Girl Shower, made exclusively in Pink Colors. Embroidered Scroll Invites in White, Ivory Colors. Boxed Scroll Invitations are also available with Matching RSVP Cards. Antique Look Scroll Invitations, Printed on our Antique Look Papers with A Gold Border. Custom Printed Scroll Invitations available in a wide variety of prints, patterns and textures. Custom Made Scroll Invitations, Printed as per clients requirements. Blank Scroll Invitations which can be printed as per customer specifications and these are available in a variety of colors and options. 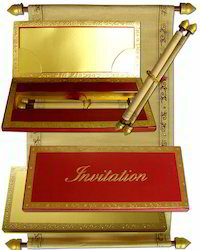 Custom Made Boxed Scroll Invitations available in a large assortment of Patterns, Colors and Themes. Blue Scroll Invitations with Screen Printed Pattern Design and Matching Envelopes available with Tassel. Simple and Elegant Pink Scroll Invitations with Ribbon Tie Boxes, available with Custom Prints as per clients specifications. We manufacture a large range of Scroll Invites in Various Colors, Prints and Themes. Wedding Scroll Invitations available in a wide variety of colors, patterns etc. Antique Look Scroll Invitations with Custom Prints as per clients requirements.We also manufacture Non woven Embroidered Scroll Invitations, which have the Back side with Embroidery and the front side plain to print the message.Black Elegant Scroll Invitations with A Good Quality Gold Screen Print. Boxed Scroll Invites can be custom made in any color combination as per clients requirements and can also be custom printed. We print our Scroll Invites in any language as per clients requirements, we have printed scroll invites in Hebrew, Portuguese, German, Italian, French, Spanish, etc.Customized Handmade Paper Scroll Invitations all made as per client specifications and also available Un printed for Whole Sale Users.We carry a large range of Scroll Invitations made as per client requirements in client specified colors and with client specified themes and prints. Custom Made, Custom Printed available in a wide variety of Colors, Designs and Textures, We carry a huge range of Scroll Invites that are suitable for use in Weddings, Baby Showers or any other announcements. We manufacture a large range of Boxed Scroll Invites wit printing made as per client specifications of sizes and colors, our invite are available in a wide variety of colors, finishes and patternsOur Handmade/ Non Woven Paper Scroll Invites are also available with Matching Printed Envelopes, We can manufacture these scroll invitations as per your range of Colors and Print Patterns, we also print inside the invites as per your specifications. Burgundy Colored Handmade Paper Boxed Scroll Invitations, suitable for Wedding Scroll Invites, we can custom print on these invitations as per your requirement. Scroll Invites are also available in Non Woven Papers also. Beautiful Contrast colored Scroll Invitations with Indian ethnic design prints, available with Box, Hard Box or Flat Box ,and all custom printed as per your requirements. We can also customize the scroll colors and themes as per your directions..High quality Scroll Invites, made using Non Woven Papers and Custom Printed as per your specifications. Using Good Quality Cotton Rag or Silk Textured Handmade Paper, we manufacture a fantastic range Of Scroll Invitations. These Scroll Invites are available in assorted Colors. Wedding Scroll Invitations available in a wide variety of colors, patterns etc. Antique Look Scroll Invitations with Custom Prints as per clients requirements.We also manufacture Non woven Embroidered Scroll Invitations, which have the Back side with Embroidery and the front side plain to print the message.Black Elegant Scroll Invitations with A Good Quality Gold Screen Print. Boxed Scroll Invites can be custom made in any color combination as per clients requirements and can also be custom printed. We print our Scroll Invites in any language as per clients requirements, we have printed scroll invites in Hebrew, Portuguese, German, Italian, French, Spanish, etc.Customized Handmade Paper Scroll Invitations all made as per client specifications and also available Un printed for Whole Sale Users.We carry a large range of Scroll Invitations made as per client requirements in client specified colors and with client specified themes and prints. Custom Made, Custom Printed available in a wide variety of Colors, Designs and Textures, We carry a huge range of Scroll Invites that are suitable for use in Weddings, Baby Showers or any other announcements. We manufacture a large range of Boxed Scroll Invites wit printing made as per client specifications of sizes and colors, our invite are available in a wide variety of colors, finishes and patternsOur Handmade/ Non Woven Paper Scroll Invites are also available with Matching Printed Envelopes, We can manufacture these scroll invitations as per your range of Colors and Print Patterns, we also print inside the invites as per your specifications. Burgundy Colored Handmade Paper Boxed Scroll Invitations, suitable for Wedding Scroll Invites, we can custom print on these invitations as per your requirement. Scroll Invites are also available in Non Woven Papers also. Beautiful Contrast colored Scroll Invitations with Indian ethnic design prints, available with Box, Hard Box or Flat Box ,and all custom printed as per your requirements. We can also customize the scroll colors and themes as per your directions..High quality Scroll Invites, made using Non Woven Papers and Custom Printed as per your specifications. Using Good Quality Cotton Rag or Silk Textured Handmade Paper, we manufacture a fantastic range Of Scroll Invitations . These Scroll Invites are available in assorted Colors. 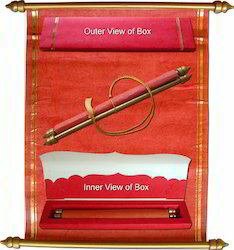 The Scroll Invitations are available in Matching Boxes.. Our scrolls are easily printable.. We manufacture a large range of scroll invitations from our extensively large range of Handmade Papers, We can print your content on the scrolls as per your specifications, the invitations can be customized to your requirements of color, size etc. Blue Scroll Invitations with Screen Printed Pattern Design and Matching Envelopes available with Tassel. Simple and Elegant Pink Scroll Invitations with Ribbon Tie Boxes, available with Custom Prints as per clients specifications. We manufacture a large range of Scroll Invites in Various Colors, Prints and Themes. Wedding Scroll Invitations available in a wide variety of colors, patterns etc. Antique Look Scroll Invitations with Custom Prints as per clients requirements.We also manufacture Non woven Embroidered Scroll Invitations, which have the Back side with Embroidery and the front side plain to print the message.Black Elegant Scroll Invitations with A Good Quality Gold Screen Print. Boxed Scroll Invites can be custom made in any color combination as per clients requirements and can also be custom printed. We print our Scroll Invites in any language as per clients requirements, we have printed scroll invites in Hebrew, Portuguese, German, Italian, French, Spanish, etc.Customized Handmade Paper Scroll Invitations all made as per client specifications and also available Un printed for Whole Sale Users.We carry a large range of Scroll Invitations made as per client requirements in client specified colors and with client specified themes and prints. Custom Made, Custom Printed available in a wide variety of Colors, Designs and Textures, We carry a huge range of Scroll Invites that are suitable for use in Weddings, Baby Showers or any other announcements. We manufacture a large range of Boxed Scroll Invites wit printing made as per client specifications of sizes and colors, our invite are available in a wide variety of colors, finishes and patterns Our Handmade/ Non Woven Paper Scroll Invites are also available with Matching Printed Envelopes, We can manufacture these scroll invitations as per your range of Colors and Print Patterns, we also print inside the invites as per your specifications. Burgundy Colored Handmade Paper Boxed Scroll Invitations, suitable for Wedding Scroll Invites, we can custom print on these invitations as per your requirement. Scroll Invites are also available in Non Woven Papers also. Beautiful Contrast colored Scroll Invitations with Indian ethnic design prints, available with Box, Hard Box or Flat Box ,and all custom printed as per your requirements. We can also customize the scroll colors and themes as per your directions..High quality Scroll Invites, made using Non Woven Papers and Custom Printed as per your specifications. Using Good Quality Cotton Rag or Silk Textured Handmade Paper, we manufacture a fantastic range Of Scroll Invitations . These Scroll Invites are available in assorted Colors. The Scroll Invitations are available in Matching Boxes. Looking for Scroll Invitations ?